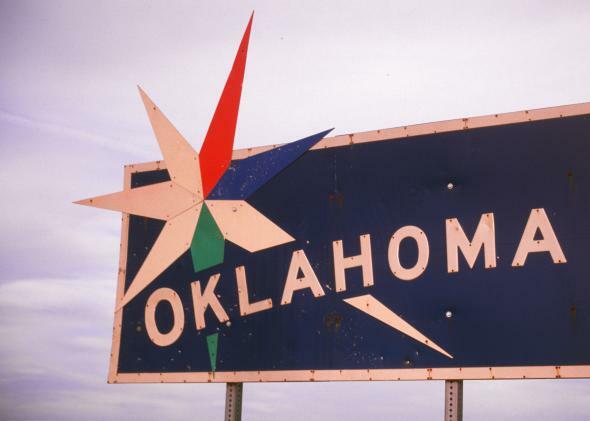 Oklahoma legislator wants anti-gay businesses to post no gays allowed signs. Oklahoma Lawmaker Wants Anti-Gay Businesses to Post “No Gays Allowed” Signs. Excellent! This state is already doing interesting things with signs. When not debating whether to outlaw hoodies or protect parents’ decision to force their children into ex-gay conversion therapy, the severely conservative Oklahoma legislature has spent much of this session debating an anti-gay “religious liberty” bill. The measure would allow both private businesses and government entities to refuse service to gay people based on their religious beliefs. Although the proposed legislation is similar to the Arizona bill that Gov. Jan Brewer vetoed last year, it actually goes much further, explicitly permitting anybody—from a hotel owner to a DMV employee to a social worker—to turn away gay people if their religious beliefs require it. Now a legislator has introduced a brilliant amendment to the House version of the bill, which, in taking the measure to its logical conclusion, explosively reveals the animus underlying it. The lawmaker, Democratic state Rep. Emily Virgin, fiercely opposes the “religious liberty” bill. But if it does pass, Virgin wants to ensure that gay couples know which businesses and government agencies will refuse them service so they can avoid the indignity of being turned away based on their identity. So Virgin’s amendment requires that “any person” who despises gay people too much to serve them must simply “post notice of such refusal in a manner clearly visible to the public in all places of business, including websites.” The amendment would promulgate the same notice requirement for businesses that refuse to service based on race or gender identity. But on another level, Virgin’s amendment simply makes good practical sense. A year ago, the New York Times’ Ross Douthat praised these kinds of faux-religious liberty bills as a compromise by the homophobic right, a key term of their “surrender.” If gay people accept Douthat’s compromise, shouldn’t we least be permitted to know which businesses are safe for us to enter and which will kick us out? Shouldn’t both sides of this debate be cheering Virgin’s amendment as an eminently sensible trade-off? Why, in other words, would anybody object to it? To be fair, Oklahoma Republicans haven’t yet responded to Virgin’s amendment, so there’s still a chance they’ll wholeheartedly support it. But if they soon come out swinging against the measure, don’t be surprised. The whole point of these “religious liberty” bills is to slide anti-gay animus into the law books without anybody noticing. Now that Virgin is shining a spotlight on the Oklahoma GOP’s efforts, their scheme is suddenly in jeopardy. With one brief amendment, Virgin has shrewdly caught her conservative colleagues in a legislative mousetrap. It’ll be fun to watch when the springs snap shut.